Giving back was the goal of this year's Warm Up the Community. Zandra’s collected more than 50 coats for the Manassas SERVE shelter. That was the goal of this year’s “Warm Up the Community” clothing drive held by Zandra’s Taqueria in Woodbridge. “The eatery collected more than 50 coats, along with numerous scarves, hats, socks and gloves during the drive, which is now in its third year,” stated a release. 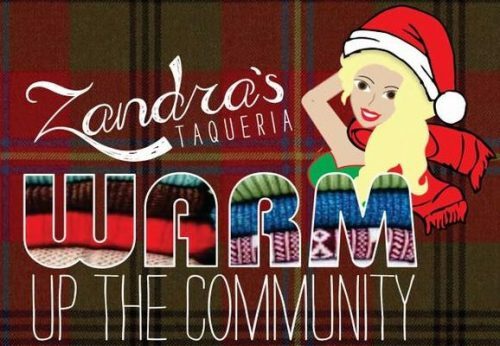 To encourage people to donate, Zandra’s offered a free taco to anyone that donated warm clothing items, according to a release. In addition to the clothing donation, Zandra’s also donated the funds raised from their hot chocolate and coffee sales at the Greater Manassas Christmas Parade to the SERVE shelter, which is a program through Northern Virginia Family Service, stated a release. “This is the third year that we have done the Warm Up the Community event. There are some families who simply can’t afford a coat or other winter necessities. This drive is our way of saying as a community, ‘We are here for you.’ It is very gratifying to watch neighbors supporting neighbors in this way,” stated Zandra’s owner Miguel Pires in a release.